Natural mineral water consists of rain water or melted snow that has slowly filtered through the ground and gathered in subterranean pools over many years. During its passage through the rocks, the composition of the water changes as it dissolves carbon dioxide and minerals. Mineral water can stay in underground deposits, or it may emerge to the surface in the form of springs containing dissolved mineral salts and sulfur compounds. Mineral water becomes effervescent if it has sufficient carbonic acid to produces carbon dioxide bubbles at normal atmospheric pressure. Mineral water is called "hard" when it has a high content of calcium and magnesium ions, and it is called "soft" if it has few dissolved calcium and magnesium ions. The U.S. Food and Drug Administration (FDA) classifies mineral water as water originating from a geologically and physically protected underground water source that contains at least 250 parts per million of total dissolved solids. Mineral content is what distinguishes mineral water from spring water. 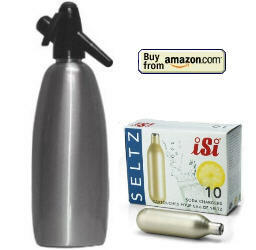 Calcium and magnesium are two essential minerals present in mineral water. Calcium is a constituent of bones, regulates muscle contractions and mediates blood clotting. Magnesium also is a component of bones, and it is needed for many biochemical reactions that help to maintain normal muscle and nerve function, keep heart rhythm steady and support a healthy immune system. The average adult requires approximately 1000 milligrams of calcium and 400 milligrams of magnesium per day. Mineral water can provide a portion of these requirements. 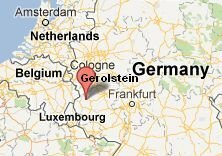 Gerolsteiner mineral water comes from Gerolstein, a small town in western Germany near the borders of Belgium and Luxembourg. Gerolstein is situated in a narrow valley along the Kyll river which flows between large dolomite and basalt mountains. Dolomite is a carbonate sedimentary rock composed of more than 50 percent calcium-magnesium carbonate (CaMg(CO3)2) from which the mineral content of the water in the region is derived. Basalt is a fine-grained, dark rock produced by volcanic activity consisting of silicates of calcium, aluminium, magnesium and iron. There are two volcanic peaks in the Gerolstein area: the Kasselburgmassiv is located on the west side of the Kyll river, and the Rockeskyller Kopf is on the eastern side of the river. The mountains in this area are part of the Middle Rhine Highlands, also called the Rhenish Slate Mountains. The northwestern part of the Rhenish Slate Mountains is called the Eifel. There is evidence that Buchenloch, a cave near Gerolstein, had human inhabitants during the stone age. The remains of a 7th century BC Bronze Age Celtic ring wall have also been found at Dietzenley which is the highest point on the mountains on the East side of the Kyll river overlooking Gerolstein. A temple and some dwellings from the Roman occupation of the area have also been preserved. 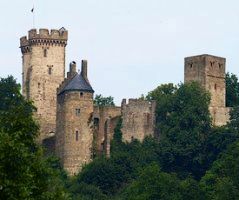 During medieval times various castles were built in the area, and some of them are tourist attractions, such as the ruins of Castle Kasselburg in Pelm, about two kilometers northeast of Gerolstein. Waters from areas with past volcanic activity are rich in carbonic acid (H2CO3) because carbonic acid develops from the degassing of carbon dioxide (CO2) when magma cools off underground and comes in contact with water (H2O) at high pressure. The carbonic acid dissolves minerals and trace elements from the dolomite rock to produce mineral water. 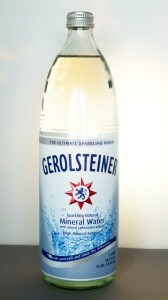 The Gerolsteiner Brunnen factory has been bottling mineral water since 1888. The factory was destroyed during a bombing raid in World War II, but it was rebuilt in 1948. The modern factory has 21 wells in Gerolstein from which it pumps the mineral water from layers of rock located up to 200 meters beneath the surface. 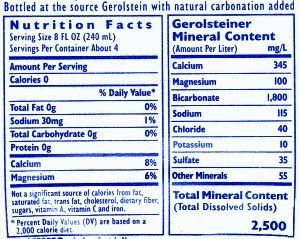 One liter of Gerolsteiner mineral water has 345 milligrams of calcium (Ca++), 100 milligrams of magnesium (Mg++), 115 milligrams of sodium (Na+) and 1800 milligrams of bicarbonate (HCO3-). Other minerals found in smaller concentrations are chloride (Cl-), potassium (K+), sulfate (SO4--) and strontium (Sr++). Gerolsteiner mineral water has twice as much calcium and magnesium as the San Pellegrino mineral water from the Province of Bergamo in the Lombardy region of Italy. Gerolsteiner mineral water is one of the most popular brands of mineral water in Europe today, and it is available throughout the world. moderate levels of calcium, magnesium and bicarbonate.